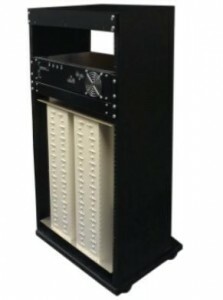 -Wave’s new VHF rack model has been uniquely designed to meet growing market demands. The RBDA-VHF/1-4/4W-60-A, operates over a frequency range from 138 to 174 MHz. It provides an output (Composite/Linear, ALC controlled) power of 10 Watts (+33 dBm) throughout the full frequency band with typical gain of 65 dB and flatness of ± 1.5 dB. Additionally, gain can be increased without having to change the 19” quarter rack enclosure. This compact modular design (40.1 x 21.5 x 13 inches) is based on a duplexed path configuration with sharp out of band attenuation allowing an improved isolation between the receiving and transmitting paths and features extreme low noise figure and wide dynamic range. Power, linearity and channel separation may also be changed to suit customer’s specific requirements.